My husband, Matt, is truly skilled in the kitchen and I am truly unskilled. I once made him a cake and used salt instead of sugar. That's a hard one to live down. Just recently I made a cheesecake and forgot to bake the crust, thinking it was a pre-baked frozen crust. We ate out the filling like cheesecake pudding. How can someone who lives the life of a foodie be so horrible in the kitchen? Besides my refusal to read directions, which proves to be a huge mistake in the kitchen time and time again, I just haven't put much effort into learning. Now that my husband and I plan to open our own food truck I figure I need some kitchen skills. While I don't plan to be the one doing the cooking I want to help as much as I can. I have a fear of knives that stems from cutting myself on a newly bought knife in a sink of soapy water. Matt insisted I take a knife skills class and found a great one at Tri-C. I wasn't sure what to expect, but I was pleasantly surprised. The class was 2.5 hours and $39. It's been taken by everyone from chefs boning up on their skills to newlyweds getting acquainted in the kitchen. Matt joined me for the class and it made a for a fun evening. I was very impressed with the Tri-C Eastern Campus facilities. They have a beautiful culinary studio surrounded by windows. Our instructor, Chef Kellie Geiger, was also impressive. She was smart, knowledgeable and a talented instructor. I would absolutely recommend her and look forward to taking another class with her soon. After being shown how to hold our knives and watching a sharpening demonstration we learned how to cut apart a chicken with our boning knives. I was a vegetarian for about 5 years and can get pretty squeamish, but this is an important skill to have. 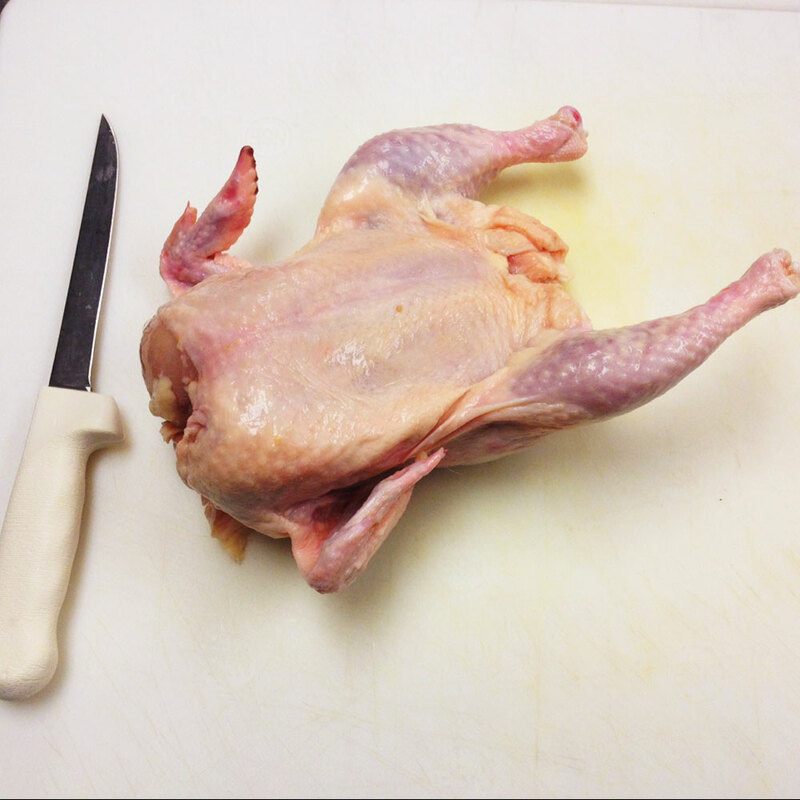 You can save tons of money by knowing how to cut up a whole chicken. The process was truly fascinating. Crack it here, run your finger along there, cut, cut and you've got two chicken breasts, two legs/thighs/wings and your carcass which they are happy to bag up for you to take home for chicken stock. After cutting up our chicken we got to season it with whatever we wanted, because next we would cook it up to take home! I thought that was a pretty amazing value for the class that we got to learn knife skills and take home an amazing meal. They had every spice you could imagine to choose from. It was a blast looking through them all and choosing. We went with a curry base, which wouldn't surprise you if you knew that Matt cooks mostly Asian foods. Then we browned it up on the stove before putting it on a baking sheet with chicken stock and covering in foil to bake. While our chicken baked we moved on to cutting up our veggies and not cut ourselves by using the bear claw technique with our hand. I have already found these skills incredibly helpful in the kitchen. I like to make my own soda syrups from fresh fruits and vinegar and as I was slicing up my apples and melon this week I found it to be easier than ever. We also learned how to make cute little veggie bundles by using a peeler to make long carrot strips to wrap our veggies in. We then took our veggie bundles and put them in a foil pouch with butter, herbs of our choosing and ice cubes, believe it or not. They came out amazing! We had a great meal when we got home and I feel a lot more skilled and don't fear the knives so much anymore. Check out the Knife Skills class and other Culinary Classes offered at Tri-C. There is an edible creations knife skills and even a pumpkin carving class on the list! They are also open to suggestions. I think an egg class would be great. I have an egg obsession right now and I bet there are a lot of tricks the would be helpful to learn.